Bare bums, pelvic thrusts and bad language - what has Chesterfield Operatic Society come to? The Full Monty presents a brave new world for a society whose lengthy history is packed with safe Broadway and West End musicals - and bravo to the Operatics for having the guts to take it on. Who bares wins obviously pays off as last night’s packed opening audience proved. I doubt The Chippendales could have elicited a better reaction. The crowd absolutely loved the show, clapping, whooping and giving the cast a standing ovation. The male troupe went all their way in the strip finale, the technical team judging the big reveal perfectly by blinding the audience with dazzling lights. While this showstopping scene will be today’s hot topic of conversation, there were plenty of memorable scenes in the run-up to it. Richard Leivers’ fumbling routine as wannabe stripper brought the house down, Steve Hayles’ fabulous dancing as Noah Simmons (Horse) wowed the audience and Pauline Hindle’s wise-cracking pianist who’d been hit on by Trump (nice update) was a delightful piece of character acting. Andy Quinn shone like the brightest star in the lead role of Jerry, an unemployed dad, separated from his wife and with no prospects of work. His solo Breeze Off The River was among the show’s highlights. Karl Brennan, director, gave an impressive performance as Jerry’s wingman Dave, his character’s insecurities masked in laddish humour as he struggled with redundancy and his marriage while bingeing on food to ease his depression. Jerry and Dave’s failings were in contrast to the strengths shown by the females in their lives. Jerry’s wife Pam (played by Georgia Thomas) was a businesswoman with new man who had a white collar job, Dave’s wife (played by Danielle Kennedy) liked nights out with her girflriends watching male strippers. The female characters appeared tougher and more demanding than the men. Society chairman Sarah Morrll gave an entertaining performance in the role of holiday-mad Vicki, dancing and singing up a storm in her solo Life With Harold. Hubby Harold (played by Glyn Daniels) went from zero to hero in his ex-colleagues’ eyes after his choreography skills were put to use in the stripping troupe. Each of the recruits to the stripping team had a hard luck story. Ryan Mitchell’s character Malcolm lived at home with his mum and was on the brink of suicide when he was rescued by Jerry and Dave from committing suicide, Heath Parkin’s character Ethan was an oddball who couldn’t dance to save his life bui fitted into the troupe because he was well endowed in another area. 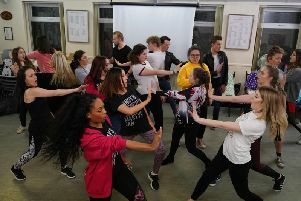 I suspect life mirrored art for Chesterfield Operatic Society’s new choreographer Sue Higgins who must have had her work cut out training the men to portray the characters of rough ex-steelworkers transforming into strip troupe Hot Metal. Matthew McGregor provided the eye candy in his role as professional stripper Keno, Alison Doram milked the laugh as bitchy glamour puss Estelle and Thomas Slater melted hearts as Jerry’s son Nathan who gave his dad the confidence to bare all. The Full Monty got the full works from a talented troupe. There’s still time for you to see it at the Pomegranate, Chesterfield, if you’re lucky enough to get a ticket before its final performance on Saturday, April 28.